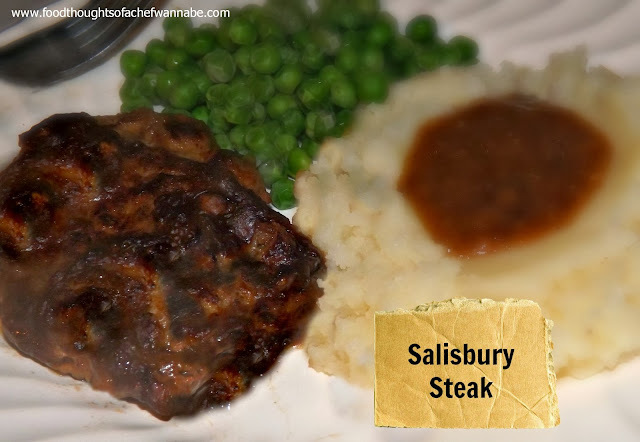 FoodThoughtsOfaChefWannabe: Salisbury Steak - School Lunch Series! Salisbury Steak - School Lunch Series! I love how so many of you have shared your favorite lunch, the cafeteria made when you were a child! I was never one of those kids who got to pack a lunch very often. I had to eat at school mostly but I LOVED it! Of course, I did not like peas and I especially did not like mushy canned peas. I swear as I type I can smell them, SKEEVY! As a matter of fact only in the last couple of years have I leaned to enjoy fresh or frozen peas. Anyway, one day, I didn't want to eat my peas, and I don't like milk so I let someone else drink half of my milk, shoved my peas in the carton and off I went to see if I could "go up", which was some kind of elementary code for taking your try and dumping its contents and giving it to the lady who washed them. Miss Vidal (you Ord Elementary peeps should remember this old battle ax) pardon my terminology. She busted me, made me go sit down and eat my peas out of my milk carton! Anyway, the purpose of telling you that story is that it was on salisbury steak day. No harm was done, it remained one of my all time favorites too. I am pretty confident I hit the nail on the head with this one. I mean, I don't mean to brag but, I have some real re-creation "skillz". The consistency was dead on an the taste was exactly what you remember only better! I used all dried herbs for this particular recipe, I don't feel like any cafeteria in the nation is using fresh herbs on a daily basis! Please, let me know if I am wrong! Let us take a trip back in time, to that cafeteria and the one, undoubtedly crabby lunchroom aide or cook. Remember her? Now, with her in mind, let's get cooking! Prepare your packaged brown gravy mix. Make alot of gravy! Prepare as directed and pour over salisbury steaks. Place in pre-heated 350 degree oven for 30 minutes. Serve with mashed potatoes and NO MUSHY CANNED PEAS!!! Also make sure to serve with a roll, all salisbury steak meals were served with a hot roll as well! I hope you enjoy your culinary trip down memory lane! Please, enjoy this recipe and keep your requests coming!! Yep, I remember Miss Vidal! She was evil! LOL Can't believe she made you eat the peas out of your milk carton! I'm excited to try this recipe!! Looks great! Makes me crave this so much!!!! thanks for sharing!